Sometimes when we ask the angels for our help, the answer we receive may not be as we expect it to be. The angels will respond in a way that is for our highest good. It may be better or different from the outcome we wanted. Also the angels work in Divine time, not human time. Divine time may be quicker or slower than what we are use to. Often the angels will show us that they are around. However, we must be aware of their messages and be receptive to what we see in the out side world. 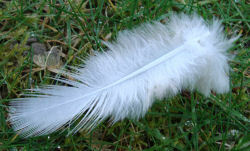 It is no coincidence that we see a white feather in an unexpected location after we have asked the angel for assistance. Or we might hear an angel song on the radio, or see an angel cloud, or the word angel writing in a magazine or as a pub sign. 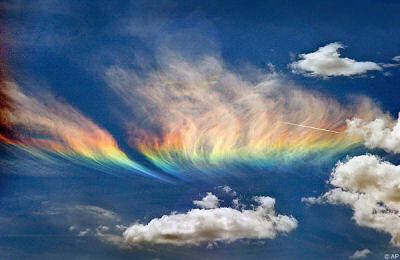 This is a sure sign that the angels have heard our request and they are acknowledging their presence to us. Sometimes in times of difficulty or illness, such signs and symbols can be of great comfort. Several months ago, during a challenge I was going through. I walked into my healing room and there was a 3-inch white feather in the middle of the room - it hadn't been there 5 minutes before. It was a great comfort to me to know the angels were supporting me at that difficult time. These are one of the most common symbols left by the angels. They are particularly important if they are found where you would not normally expect to see a feather for example inside your house. There are several stories on the angel stories page where white feathers have appeared at an appropriate moment, suggesting an angel was present. For example in snow, mud, rocks, leaves, shadows etc or even in cloud formations in the shape of angels. Especially if one appears as you are talking or thinking about angels. In fact anything that has the name angel or angelic on it. For example a pub name, a picture in a shop or mention of the word angel in a newspaper. Hearing a song on the radio or television about angels. Abba (also remix by Westlife): "I have a Dream (I Believe in Angels)"